· Due to different processes, the red version uses a double-layer vacuum plating process inside and outside, which is matte in appearance. · Rectangular magnet buckles and half-circle magnet buckles are shipped randomly according to FBA inventory. Not only we make preminum watch band, but also we provide excellent customer care. We never let our customers down. If you have any question with our product or service, simply send us a message via "Contact Seller". 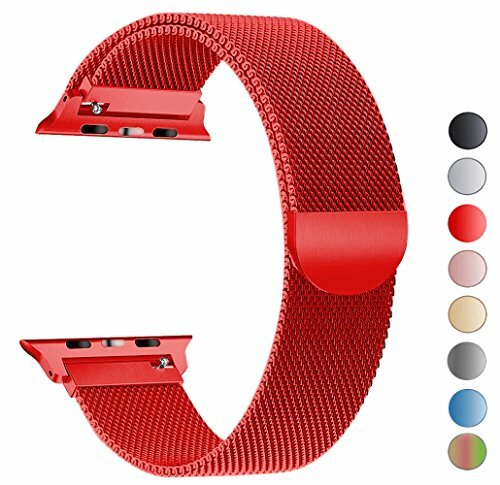 ★ BEST COMPATIBILITY - This band is fitable for all apple watch series1/2/3/Nike+, and suitable for men and women of all ages. ★ STAINLESS STEEL 316L & MAGNETIC CLASP - What we use is adjustable super magnetic buckle and firm 316L stainless steel, what we do is only for your best wearing experience. For quality, we are serious. ★ VACUUM PLATING PROCESS - Unlike most water-plated Milanese Loop on the market, our band use a stainless steel vacuum plating process (cost 20% higher than water-plated products), breathable and does not damage the skin, and will not fade while wearing. ★ CLASSIC MILANESE LOOP - A simple design always helps you adapt to most occasions. Seoaura hope our milanese loop let you wear different watches on sports, daily life, graduation parties, business meetings and other occasions, great replacement for silicone, leather, nylon, wooden and other metal apple straps. ★ 60 DAYS WARRANTY - Your satisfaction is great honor for us. Seoaura guarantee to offer a free replacement or refund if anything goes wrong about the product within 60 days. If you have any questions about this product by Seoaura, contact us by completing and submitting the form below. If you are looking for a specif part number, please include it with your message.